USL students conducting exit polls at Sunrise Presbyterian Church (l-r): Noah Rucquoi, Matthew Wright, Emma Bluestein and Mary Wade Brewer. Long before Joe Cunningham was declared the winner in a tight race to become South Carolina’s District 1 representative in Congress, University School students had tabulated data from approximately 2,000 exit polls showing that he was expected to win in Charleston County with a 2-1 margin. Third through 12th graders from University School of the Lowcountry spent Nov. 6 polling voters at Sunrise Presbyterian Church on Sullivan’s Island, Isle of Palms Recreation Center, and Isle of Palms City Hall, as well as 23 additional sites around Charleston County and two sites on Daniel Island. Many students were surprised by the long lines they witnessed and appreciative of how courteous the voters were that they interacted with. “At USL, we learn all about connecting with the community and to use our voice in the real world. 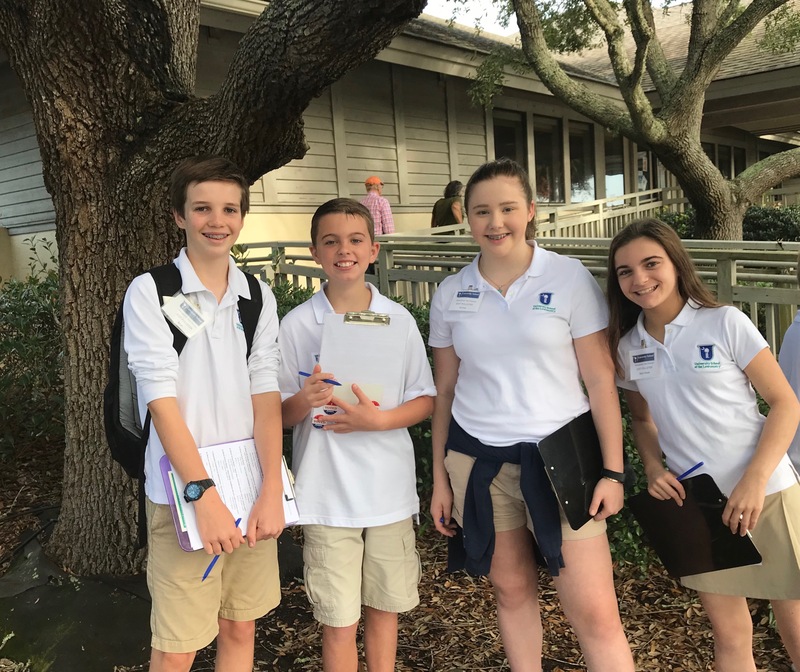 Exit polling is one of the best ways we demonstrate this,” said 6th grader Kit Jones-Painter, who conducted exit polls at the Isle of Palms Recreation Center. Aside from helping students better understand civics and the ebb and flow of turnout rates for different types of elections, the students also learn valuable lessons about mathematics and statistics when they tabulate their data and make predictions about the election outcomes. The students have a strong track record of correctly predicting the outcomes of everything from referendums to Presidential elections. In preparation for exit polling, students heard from guest speakers representing many political parties—Katie Arrington (Republican), Melissa Couture (Libertarian), JA Moore (Democrat), and Gregg Jocoy (Green Party). Additional presentations that helped students better understand elections and civics were provided by The League of Women Voters, Jay Bender, who serves as legal counsel to the South Carolina Press Association regarding the freedom of speech, and former Charleston mayor Joe Riley. “Part of our focus at USL is helping our students become engaged and informed citizens,” said founder and head of school, Jason Kreutner. “Hearing from candidates and party representatives whose perspectives might differ from their own also creates a culture of civility and empathy. All of this helps our students better connect with our annual exit polling efforts,” he said. University School of the Lowcountry is a non-profit, 501 (c)(3) tax-exempt independent school serving students from third through 12th grade. USL is a non-sectarian school for high-achieving, nice, curious students emphasizing individualized academics, experiential learning, and a strong sense of community. USL is accredited by the South Carolina Independent School Association and is celebrating its 12th year of serving children and families throughout the greater Charleston area. For more information please visit USLowcountry.org or call 843.884.0902.